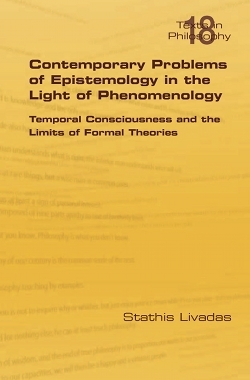 This book comprises a collection of 12 research articles pertaining to the influence of phenomenological analysis on current issues of epistemology, this one meant as a philosophy of science. Ten of these articles have already appeared in various research journals of the field at large and have been to a considerable extent re-edited, updated and in certain respects reworked. The remaining two are published originally for this book and naturally complement and invigorate the argumentation and the scope of the published articles. Overall, the content of the book can be described as an original attempt to demonstrate the relevance of Husserlian phenomenology with regard to theoretical questions arising from the contemporary evolution of such diverse scientific fields as the foundations of mathematics and the interpretation of quantum mechanics. "Stathis Livadas has pushed the investigation of the foundations of mathematics and of present day physical theories out of a strictly analytic point of view, by considering a phenomenological approach on these matters. According to him mathematics and science present various ambiguous notions which cannot be, in principle, resolved by analytical means only. Therefore, a more general approach is pursued. This book contains several of his already published articles, and now they are put together for a more general audience in the form of a book. I think that this line of investigation, facing current epistemological issues under a phenomenological point of view, is fruitful and relevant, and ought to be considered by a wide range of philosophers." Décio Krause. Universidad Federal de Santa Catarina, Brazil. "Stathis Livadas book embodies a masterly analysis of some important questions in the philosophy of mathematics and in Husserls phenomenology. According to Livadas, non-Cantorian theories and intuitionistic ones are "trapped" in the impredicativity of the continuum when they shift the boundaries beyond naturally intuited countability in our witnessed universe. In this perspective, from a theoretical point of view, mathematical intuition is not eliminable. Hence the challenge to point out to the intuition of continuum in accordance with a phenomenological point of view, i.e., making essential reference to the existence of a categorial intuition based on the intentionality of primary experience which is genetically constituted in the unity of the flux of consciousness." Arturo Carsetti. University of Rome "Tor Vergata"